Coffee Table guests Carol Dee, Jessica Golden and Vivian Finlay at KBBI. The holiday season is upon us. But it’s not an easy time for everyone. This week on the Coffee Table: coping with grief during the holidays. 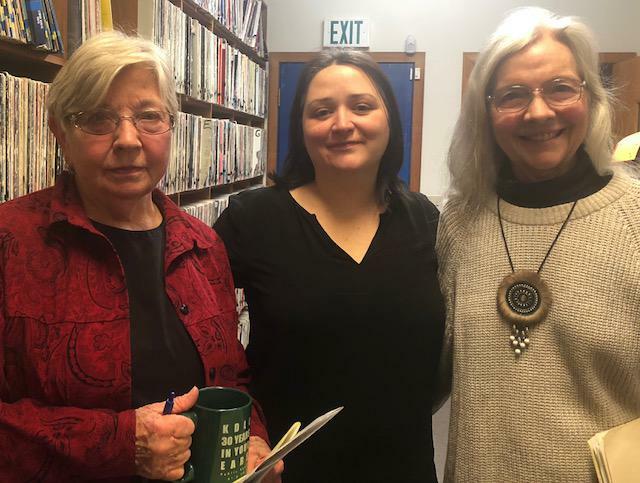 Jessica Golden, executive director of Hospice of Homer, Carol Dee, the coordinator of hospice's bereavement program and administrative assistant, and Vivian Finlay, licensed marriage and family therapist and hospice volunteer joins KBBI’s Renee Gross to discuss how to take care of yourself and others this holiday season. Today on the Coffee Table, we're talking about the Kachemak Bay State Park draft management plan. The public comment period on the plan ends Friday at 11:59 p.m. KBBI News Director Aaron Bolton speaks with DNR spokesperson Monica Alvarez, Robert Archibald who sits on both the Kachemak Bay State Park Citizen Advisory and Friends of Kachemak Bay State Park boards, and True North Adventures guiding business owner Alison O’Hara.